I am typing this post with one hand while Aspen naps and “Hazy Babe” cuddles into my chest. He has been with us for 8 weeks today which astonishes me both because it feels like that time has gone at warp speed and because it feels like he has always been a part of our family. I’ve gotten SO many questions about what I am eating and how I’ve dropped weight after having Hayes, so I wanted to share my postnatal diet and exercise regimen, and what’s been working for me! I will start with exercise because it’s short. I JUST stared working out again. I feel so strongly that it is important to let our bodies heal after growing humans before starting to break down muscle tissue again and really even be in the mindset of trying to get back to a “pre-baby” bod. Don’t get me wrong, that’s not to say that I didn't squeeze back into my skinny jeans the very second I could, but I did NOT push myself back to a fitness regimen prior to being 6 weeks postnatal and visiting a physio first to ensure I was recovering well and my body was ready for it. Even now I’m working out once to twice per week and taking it extremely slow. In addition to that I am walking a ton and wrestling my toddler which is a GREAT workout! I lease Aspen out by the hour, he’ll give you a GREAT workout, you can shoot me an email for rates [this is a joke]. So what am I eating? Well - all of the things! I have had quite the appetite as I am breastfeeding and I have so enjoyed filling my body with good fats, proteins and anything that will nourish me and my babe. And cookies. There have been lots of cookies too - ha! Here is the lineup of my postnatal diet go-to’s! Celery juice? Yep! On an empty stomach, first thing in the morning, a big (8-16oz.) glass of freshly juiced celery! One of my favourite health + fitness gurus Melissa Wood noted that she was doing this as part of her postnatal regimen and when I researched it I was absolutely floored! The far reaching health benefits that are alleged to come from starting your day with fresh celery juice far outweigh the small headache of procuring that much fresh celery and cleaning a juicer on the daily. Not only is it gut healing, but it is a highly alkalizing food (so it fights inflammation in the body) and is great for your skin which can become very easily dehydrated after giving birth, especially if you are breastfeeding! I had the worst case of hair loss and dry scalp after giving birth to Aspen, I mean the worst! I was shocked I wasn’t bald I was losing so much hair and I’m convinced I may have even had some form of psoriasis on my scalp. I did absolutely everything to try and treat it including seeing a naturopath and going on a really aggressive elimination diet. In the end a nice cut & colour did the trick [no lie], however, this time around I’m being more proactive to ensure my skin, hair, and nails don’t suffer from depletion - collagen to the rescue! One of my dear friends, Amanda Hlatky, who owns Glow Dermal Therapy gifted me the best and most thoughtful post-baby gift - collagen! withinUs Naturals Matcha Misto to be exact. Collagen is an amazing thing to add to your postnatal diet to ensure your body stays nourished and you looking your best [hpwever it doesn’t help with zombie eyes, unfortunately]! It’s important to note that incorporating collagen into your diet should remain consistent in order to reap the benefits. Also, not all collagen is the same and it’s important to find a clean, high quality source which is what I really like about the withinUs products. Avocado, eggs, coconut oil, almond butter, olive oil and macadamia nuts. I am eating so much of all the good fats and it feels really good to nourish my body that way, and know that I am nourishing Hayes with these good fats as well! Coffee - a new mama’s best friend. I literally do not know what I would do without coffee in hand on those days following the nights of no sleep. It’s my comfort blanket. It’s my best friend that tells me everything is going to be ok. I genuinely LOVE coffee, and yes I am drinking it postnatally while breastfeeding, BUT I am careful to watch my intake as it truly is such a strong stimulant and can very much negatively affect baby. On those days that I feel like I need more than one latte, I have really been enjoying kombucha or a lightly caffeinated tea for an afternoon pick-me-up. Pretty straight forward on this one. I naturally tend to eat lots of fruits but am really enjoying raw fresh vegetables with the Okanagan Caesar Little Creek dressing you can get at Whole Foods - so good! You get the point. Whatever you need to call it to be drinking it constantly - hydration is SO important! My girlfriends and I have joked about the unquenchable thirst we have felt while breastfeeding, as though literally every last drop of fluid has just been sucked out of our bodies. But when you think about it, it makes sense! There is a lot of liquid leaving your body to nourish babe. And don’t think you’re off the hook if you have baby on formula. Staying hydrated is one of the best things you can do to combat those short nights and aid in recovery. I like to reward myself for drinking water by buying cute and fun water bottles that I will want to take with me or keep nearby - why not make it fun? 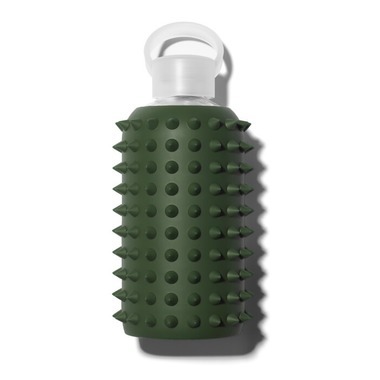 My favourite are the spiked silicone covered glass bottles from Bkr. Remember to avoid BPAs! When buying a water bottle, try to stick to glass or metal. Overall I’m feeling good and I know nutrition is SO key to postnatal recovery! Bottom line, nourish yourselves mamas. It’s the very best thing you can do you for yourself and your family.